Meanwhile the capacity of the battery is defined based on discharging (at constant current) in 10, 20, 48, 72, or 100 hours until the cell voltage falls to 1.75V (10.5V total). 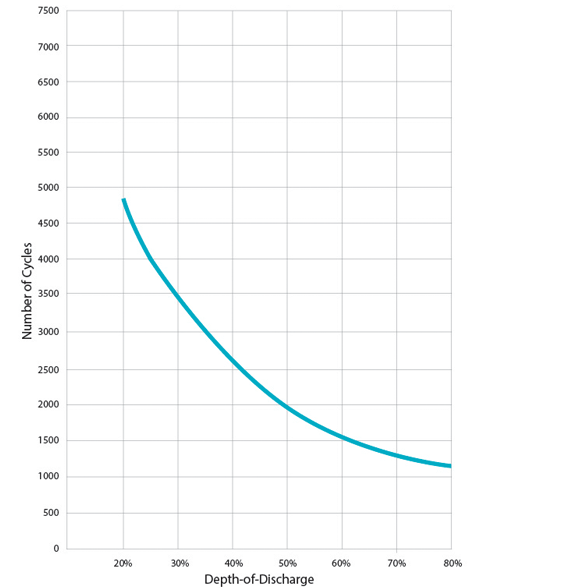 According to the manufacturer's data, the total lifetime capacity of the battery (number of cycles * depth of discharge) doesn't appear to be significantly different between 20% and 80% DoD. So if we want to know how much real capacity the battery has, it seems we can use 12V * C * 80%. The C10 figure is 179Ah, C20 is 204Ah and C100 is 225 Ah. So at C10, 17.9A, that's 12 & 179 * 0.8 = 1718.4W. However, is it possible that the voltage drop due to the current & internal resistance of the battery is distorting the figures? Or is this insignificant? The manufacturer do not quote below a C10 figure (17.9A, equivalent to around 170W after inverter & distribution losses). Is this the maximum current draw? Or could you go to, say, C5? that the ratio of, say C10 to C100 isn't completely consistent across battery chemistry, however they do quote C5 numbers for some of the AGM & gel batteries. Is there in fact a possibility to use a higher discharge current for gel/AGM vs lead acid? And as such perhaps a better battery chemistry for the deep cycle, fast discharge use case (let's say we we get a 1 hour powercut and want to discharge at, say C2, and have a generator for backup in the case that it goes over 1 hour)? Secondly in terms of charging the battery, the SPRE 12 225 states 'a maximum charge current of 13% of C20 rate'. Does this mean 13% of the C20 capacity of 204Ah = 26.5 A charging current, and hence we can charge from 20% to 80% (122.4Ah), say, in just over 4.5 hours? doesn't appear to be significantly different between 20% and 80% DoD. It appears to me if the DoD is 20% (80% SoC) you will get almost 5,000 cycles. If discharged to a depth of 80% the number of cycles will only be about 1,000, or 80% less life. Is there in fact a possibility to use a higher discharge current for gel/AGM vs lead acid? Gel and AGM are Lead Acid. You may mean Flooded Lead Acid. Discharge current is different for each type of Lead Acid. An AGM can be charged up to 5 times faster than a flooded or gel. Be aware that AGM does not like heat and a faster charge rate can increase the temperature. BU-201: How does the Lead Acid Battery Work? in just over 4.5 hours? No, typical flooded lead acid (e.g.SPRE 12 225) charge time is 12-16 hr. See also Charging Lead Acid. Your 20% to 80% is ambiguous. Do these percentages refer to SoC (capacity) or DoD (discharge depth)? If the battery is discharged (DoD) 20% (80% capacity remaining SoC=80%) then charge time could reasonably be 4.5 hr, but I did not see that information in the linked document. Not the answer you're looking for? Browse other questions tagged batteries lead-acid battery-chemistry or ask your own question.